Translated by Badee Dueik and interpreted for written article by ISM members. Abdullah and Saleh live with their families in the Tel Rumeida area of occupied Hebron, under Israeli control. They are both twelve, and have been best friends for around four years. 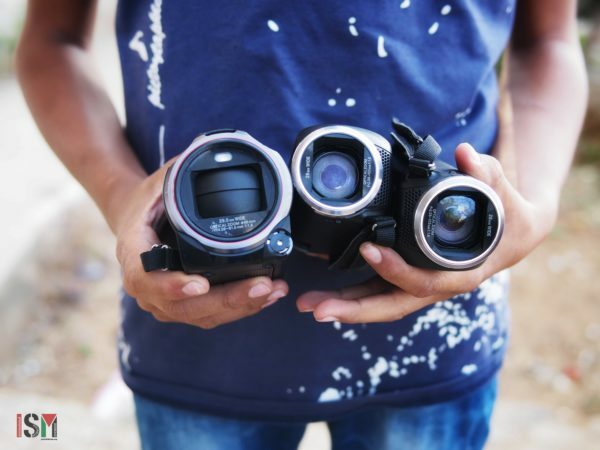 They are the youngest members of Human Rights Defenders (HRD), a collective of Palestinian activists who use journalism and video to expose the daily crimes committed by the Israeli occupation forces and Zionist settlers in Al-Khalil. We talked to them about their work, their motivation and their experiences on the job. How did you become involved with Human Rights Defenders? Abdullah: I love doing this. I had my camera with me most of the time anyway to film my friends, but I started filming for HRD about a year ago. 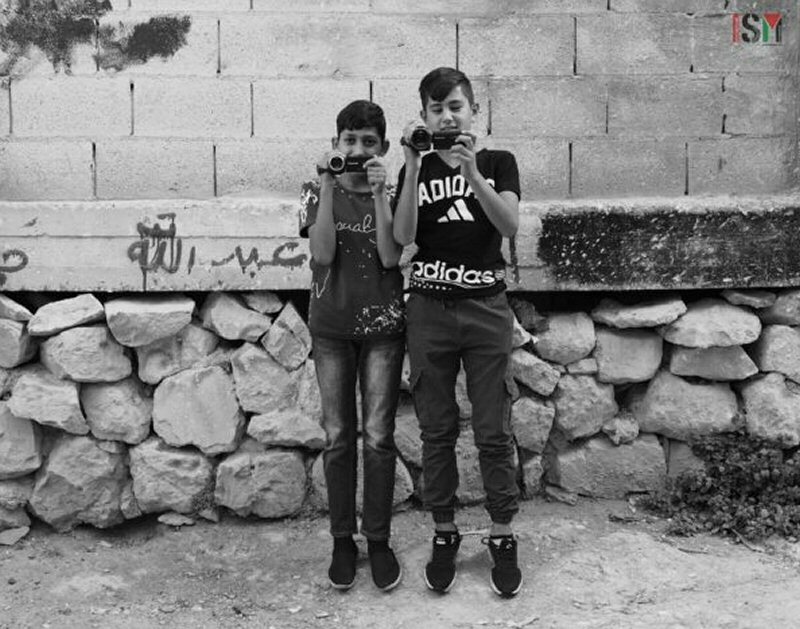 Our dads [Badee Dueik and Imad Abu-Shamsiya, both prominent members of Human Rights Defenders and local activists] taught us how to catch violence from the army and humiliation of Palestinians by soldiers and settlers on video. 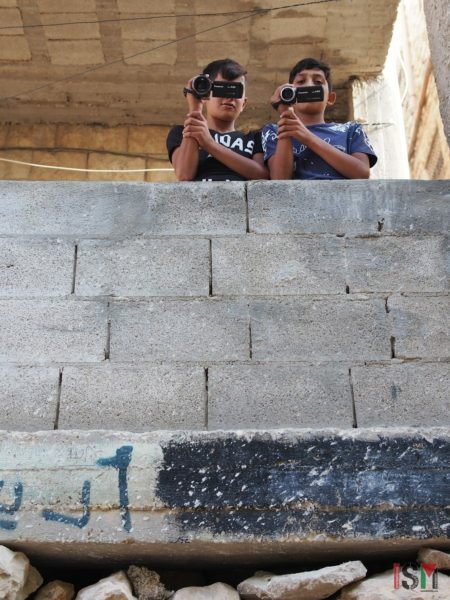 Saleh: I’ve been documenting the crimes of the occupation since I was about eight. Step by step, I learnt how to use the camera by filming the soldiers. Our dads helped with the technical side like editing, gave us ideas about how to make films or where to film from, and taught us how to protect each other. And how do you protect each other? Saleh: One of us is always filming the other. In February, we were filming soldiers detaining Palestinians by the Ibrahimi Mosque, taunting and humiliating them. Then they arrested Abdullah, but I managed to get away and made sure to film the whole thing. This helped with the arrest because we knew where they took Abdullah, and it was proof that he hadn’t done anything wrong. There was no media around – I was the only one there, so if I hadn’t filmed it we don’t know what might have happened. Abdullah: Before that, in October, I was arrested and kept for a day by the soldiers, and Saleh filmed that too. I was on the way to visit my grandparents, when they arrested 18 kids including me because they said we had been throwing stones. My dad was in Ireland at the time, and only found out when he saw the video of me being taken on our facebook page. Saleh: We use the videos as evidence – proof that it’s the soldiers who are committing the crimes, not us. We film to expose the violations of international law by the occupation. Have you had to deal with any other problems when you’ve been filming? Abdullah: In December, my uncle was sick and needed to get treatment at the hospital, so my other uncle went with him. At the Zaher roundabout, the army wouldn’t let them pass and began to beat my sick uncle. When my other uncle tried to protect him, the soldiers beat him too but he managed to get away. Then they took my sick uncle to the military checkpoint, and I went to film the situation. They told me to leave but I refused – I was not doing anything illegal. So they arrested me and kept me for seven hours. Saleh: The last time they detained Abdullah was in February when he was taken for three hours. All the adults went to march through the souq to the Ibrahimi mosque, and Abdullah and I went to represent HRD. We were filming people being humiliated, body searched and stopped. The soldiers told us to leave but we stayed to carry on filming, so they followed us and arrested Abdullah, which I filmed. Abdullah: My dad asked the soldiers why they had arrested me. They told him it was because I was filming them, and my dad said, ‘I taught him to do that’. Saleh: We use these small Panasonic video cameras, like all the HDR members, because they are less obvious. But the soldiers and police often confiscate or break them, which is another problem we have to face. Your job can be dangerous. We’ve witnessed both of you suffering from tear gas inhalation during demonstrations at different points in the past, for instance. How do you cope with that? Abdullah: It’s scary. Yes, I do get scared when they fire tear gas, which makes us cry, and throw stun grenades as well as firing rubber coated steel bullets and live ammunition at the Palestinian people who have nothing to protect themselves with. Saleh: It’s dangerous but we try to protect ourselves by keeping a distance between us and the soldiers, and using the zoom on the cameras. We also try to protect the ISM volunteers by filming them. Tell us more about what you have seen and caught on camera. Saleh: One day the soldiers were humiliating students on their way to school in the Jaber neighbourhood by the Mafia checkpoint. 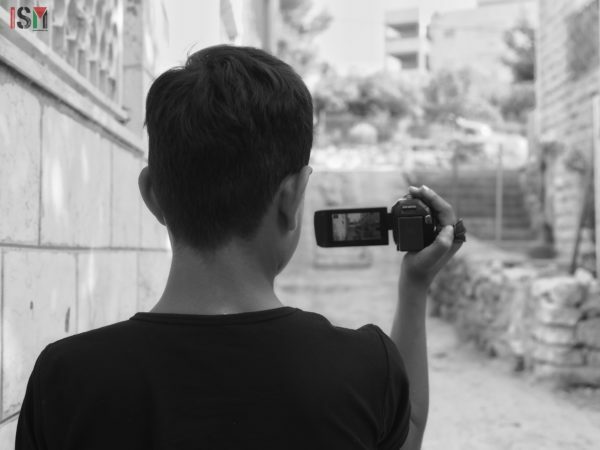 Amir [another young member of Human Rights Defenders whose father, Aref Jaber, is also a local activist and part of HRD] was filming the evidence at a distance. When the soldiers saw they were being recorded they released the boy who was being searched and detained. Abdullah: The culture of of kids being able to document the crimes of the Israeli Occupation Forces really scares them. The new law [the Knesset is currently considering a law banning the photographing or filming of soldiers, punishable with up to 10 years of prison] proves what we’re doing is working, that it’s making a difference. A kid can break Israel’s image with just a camera. Saleh: The camera is our peaceful weapon. Saleh: We both want to be journalists, so we can continue to expose the crimes of the Israeli occupation. I want to work with international media, like Al-Jazeera, because it reaches more people. Abdullah: Me too. We want to show the whole world – Arabs, Israelis and the international community – the evils of the occupation. Saleh: I still want to work for HRD too. Abdullah: But HRD isn’t international, remember. How do you get the best shots? Saleh: Hold your filming wrist with your other hand and keep your arm holding the camera close to your body, to keep it from shaking. Abdullah: Remember the rule of thirds – use the grid on the camera to balance what’s in the frame and leave space above the head of the person you’re filming to show where the incident is happening. We can also climb up walls and onto roofs to get a better view because we’re smaller than the others – so it can be an advantage! Saleh: The main thing to remember is to stay safe: keep away from the soldiers and the violence. You are some of the youngest activists in the whole of Palestine! Can you tell us more about that? Abdullah: We feel like it is our responsibility to show the international community the reality here, and one day we hope to go abroad to tell the world what is happening. I love doing this. Saleh: Me too. It is an important message that we want to tell the world – there are kids here who are trying to show you what is happening. The occupation is not only an issue for the adults but also something the children have to suffer from right when they are born. 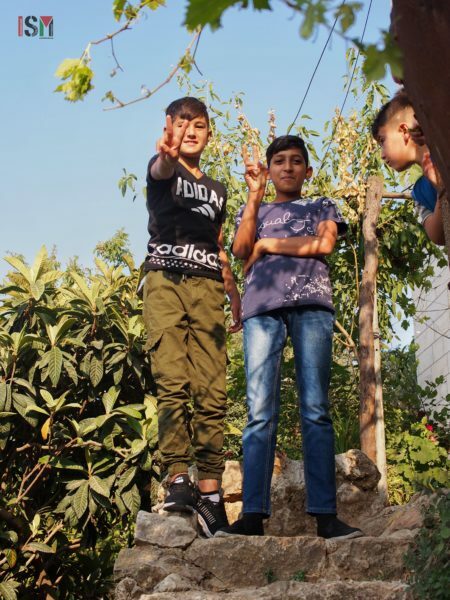 We are documenting the daily injustices committed by Israeli forces, and this proves that even kids can use non-violent resistance to fight the occupation. Abdullah: We record examples of what kids have to go through under this military occupation from our own point of view, like child imprisonment. Our videos can be used in the international criminal court. We upload our material to YouTube and then we can make documentaries, which many media platforms use. Is there anything else you want to tell the people who will read your interview? Saleh: We would like to encourage more children in Palestine to get involved by learning how to document the brutal occupation and expose the violence happening every day. Abdullah: We want to ask international kids around the world to pick up a camera as a peaceful weapon to use against any injustice, however small. All videos featured were filmed by Abdullah or Saleh for Human Rights Defenders. View more of Human Rights Defenders’ work and follow here. Sign the petition calling on Israel’s parliament to oppose the bill criminalizing the documentation of soldiers here.